The house is very large and elegant. Wainscotted in carved satin-wood and ebony – mantles and mirror frames to match – and draperies &c in imitation of the old Moorish leather hangings, stamped in scarlet velvet, and gilded arabesques, for one parlor – the other in white and gold – the dining room in oak, with encaustic tiles, imitating Florentine mosaic set in the panels – hall and stairway of black walnut, with floors in parquetrie of oak and walnut. All very fine – but it was strange to see in this magnificent house, no works of art, no bronzes, marbles or even Parians – not a picture worth glancing at – this for people always wealthy and no longer young, betrayed some great want in taste & culture. Sunday, 12 April 1863: …We dined on Thursday with Emily Adams – a small party, to meet Dr. & Mrs. John Ware – she was the Miss Chandler who wrote that admirable book “Elements of Character.” Emily has seen a good deal of her at the “Mammoth sewing circle” this winter and is charmed with her; she is a remarkably agreeable, unpretending woman, with a little rusticity of manner, but easy and lady-like. I am going to see her some day with Emily. Monday, 13 April 1863: Rebecca [Wainwright] sent me her ticket for Miss Sedgwick’s readings to-day, as she was too tired to go. Miss S. is a cousin of the authoress, and is reading to several sets of ladies, at different private houses. This was at Mrs. Bennet Forbes, who has old Mrs. Upham’s house this winter. Her reading seemed to me affected and sometimes false in emphasis. Her selections from the Brownings, Hood, [Henry Wadsworth] Longfellow &c. &c. were excellent. After dinner I took the little boys to get capped and shod – then shopped for other matters, [and] went to tell Emily Adams that Sam and I could not go to Manchester tomorrow with her, much as we would like to. The sewing circle meets here. Called at Rebecca’s, and Mother Gray’s, and while at the readings this morning missed a visit from the Misses Schuyler, to my regret. Mary [Gray] is full of some theatricals for which she is studying. Mrs. Richards has dramatized a popular story – “Louie’s Last Term at St. Mary’s,” restoring Louie to health and happiness at the end – instead of killing her off, as the book does. A very cheering letter yesterday from F.H.G. has quite relieved my mind about him; he was so poorly, when I left, as to make one very anxious about him – but now that his troubles have passed off, I can begin to enjoy myself unhaunted by thought of coming serious sickness. A letter from Mrs. Shober too yesterday asking if either of my artist children could undertake two or three small illustrations for a book. It was a very kind recognition of their young abilities in that way – but they have never attempted any thing so ambitious in original designs, and have no knowledge of the rules of perspective as yet – so I wrote at once their regrets, and suggested her applying to Kate Drinker, who is very expert at dashing off such things, in effective style. Entry for 15 March 1863. Entry for 4 June 1863. Sarah Frances Loring (1811–1892) married Dr. Gray’s brother William in 1834. The Grays lived at 20 Mount Vernon Street; William Gray’s mother and some of his unmarried siblings were at 22 Mount Vernon. See also Note 18. Isabella Pratt Welles (1812–1888) married Horatio Hollis Hunnewell in 1835. They had previously lived at 24 Mount Vernon Street; their new house was at 130 Beacon Street. The diarist’s son Samuel Shober Gray (1849–1926). A recent invention, Parian porcelain mimicked marble. 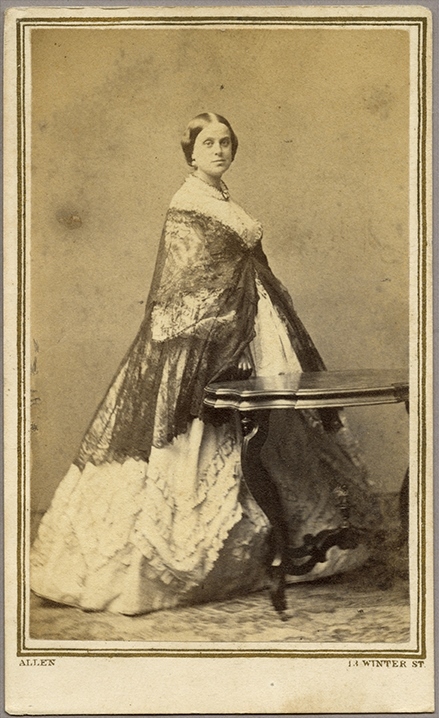 The diarist’s close friend Emeline Matilda Adams (1823–1883), who married Caleb Agry Curtis in 1864. Mary Greene Chandler (1818–1907) married Dr. John Ware in 1862. The Elements of Character (1854). A Civil War-era amalgamation of smaller sewing circles in Boston. Rose Greene Smith (1802–1885) married Captain Robert Bennet Forbes in 1834. Elizabeth Barrett Moulton-Barrett (1806–1861), author of Sonnets from the Portuguese (1850) and Aurora Leigh (1856), married the poet Robert Browning (1812–1889) in 1846. Mrs. Gray was taken into the 1842 Sewing Circle at the time of her marriage in 1844. The diarist’s mother-in-law, Mary Clay (1790–1867), was married to William Rufus Gray 1809–31. Cornelia Wells Walter (1813–1898) was married to William Bordman Richards 1847–72. Louie’s Last Term at St. Mary’s (1860) by Miriam Coles Harris (1834–1925). The diarist’s stepmother Lucy Hall Bradlee (1806–1902) was married to Samuel Lieberkuhn Shober 1830–47. Mrs. Gray’s cousin Catharine Ann Drinker (1841–1922), who married Thomas Allibone Janvier in 1878. Mrs. Gray’s eloquent description of Manchester-By-The-Sea, as it is known now, sent me to Google. There I found several images that almost do justice to her words. Also, a movie by the same name will be out this December. It was premiered at the Sundance Film Festival earlier this year.